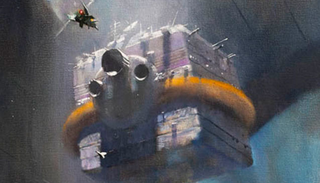 There’s a category of science fiction that we really like: the well-worn space opera. Spaceships, crews, mysterious cargos, smuggling runs across the galaxy, and the like. Mike Brooks’ debut novel Dark Run has all of that and more, and we chatted with him about how he put this world together. Dark Run is a fun novel: set in an inhabited universe, captain Ichabod Drift and the crew of the Keiko are hired to deliver a mysterious cargo to Earth, only to find that they’ve taken on more than they bargained for. Gizmodo: Dark Run is your first published novel: when did you first discover science fiction and how did you set about writing this book? Mike Brooks: I honestly can’t remember when I first discovered science fiction - possibly seeing Return Of The Jedi on the TV when I was young. I know I saw that before Empire; I actually saw A New Hope last, all of which might explain why I’m more positively disposed towards Ewoks than most people are. That and I grew up with the Ewoks cartoon... but I digress. Regardless of the when or where, science fiction and fantasy have been the staples of my reading and watching diet for as long as I can remember. Most children’s books feature at least some element of fantasy, be that witches, fairies or pets that can think like humans and talk to each other; it’s only as people grow older that they tend to be introduced to “realistic” fiction. I’d really love to see an author of literary fiction asked when they first read a novel without any fantastic elements and why they decided to pursue that genre! As for how I set about writing Dark Run, it’s not actually my first novel; it’s not even the first novel I’ve written with the help of an agent. I’d written three novels (or at least, novel-length collections of words) before I got taken on my by agent Rob Dinsdale, and then wrote another with his guidance in our first attempt at getting published. That one fell at the last hurdle with the UK publishers who eventually picked up Dark Run, but by then we knew that we had their interest. It was just a case of what to write next. I had a load of potential ideas, so I discussed with Rob about what looked to be the best bet. We decided on a science fiction idea that I’d been kicking the basics of around in my head for a little while: one month later I had a synopsis, and four months after that I had half a novel that got us an offer. So in one respect I wrote it because we thought that was a good bet for getting published, but it wasn’t written to order: it was a story I wanted to tell, it was just that there were others I want to tell too and this one got bumped to the front of the queue. What I loved about this novel is how much of a solid space opera: spaceship, adventure, fights, etc. What were some of your inspirations? I’d be lying if I didn’t say Joss Whedon’s Firefly, as anyone’s who’d read the novel and seen the show could probably guess. There’s also probably some elements of the Ketty Jay novels in there too, although I’m pretty sure they owe their own debt to Mal and co. However, in terms of adventure and fights, out of all of the Keiko’s crew I think it’s fair to say that only Jia Chang is actually looking for adventure: everyone else wants a quiet, comfortable life, but just can’t seem to find it... and that’s the key, I think. I have little sympathy for people who go looking for fights, but that’s not what the Keiko’s crew do: they only fight when they have no other option. So they may be adventurers, but they’re reluctant ones. They’ve had adventure thrust upon them, and I feel that they are the most interesting stories. In terms of the general ‘feel’ of the universe, I was particularly struck by a quote from a member of the Blade Runner crew that I saw on a documentary once, when he saw the film’s set and said “Oh my God: the future is old”. We live in the future now, with our smartphones and bluetooth and gods know what else, but there are still parts of our world that are old and broken down. I don’t see that changing, which is why I don’t buy into the squeaky-clean, shiny Star Trek versions of the future. Something like Alien where the spaceship is a grubby eighteen-wheeler in space analogy seems far more likely to me, or even the Warhammer 40,000 universe where stuff’s always breaking down and no-one really knows how to repair it anymore. Your central character here is Ichabod Drift, who would be recognizable to most fans as an anti-hero. What inspired this character, and how did you discover his voice? The honest answer is I have no real idea! Rourke and Drift just popped into my head one day as a pair of futuristic conmen (and they were conmen at first, until I decided to make Rourke female). From there their characters developed, and they always were a partnership: neither would be as successful apart as they are with each other. Drift is the classic conman; handsome, charismatic, smooth-talking and with a smart business brain, while Rourke is the person who gets things done, watches their respective backs and fights their way out if the deal goes sour. One thing I realised well after I’d started writing Drift is that he feels, to me, very similar to a certain sort of pro wrestling character (people might laugh, but some pro wrestling personas actually develop into very nuanced characters, and it’s even more amazing when you consider that the basic premise of pro wrestling is ridiculous and so the people playing them have to work doubly hard not to just sound ludicrous). Drift would be the sort of charismatic showman who sells you on his own hype so hard that he ends up buying into it himself: Chris Jericho, perhaps, or The Rock. The most important thing about Drift is that he is always, always playing a character, and he just adapts to fit the occasion. He’s been doing it for so long now that it’s practically second nature. I think I can safely say that of all the characters in the book, only Nicolas Kelsier has ever seen the “real” Drift, and that was a long time ago. I’m not even sure if there is a “real” Drift now. Your characters live in an inhabited universe, with terraformed moons, planets and space stations. How did you go about constructing this world and its inhabitants? I made it fit what I needed! I like to stick close to science where possible, but sometimes I have to just ignore it in order to tell the story I want. That said, there’s nothing to say that we won’t find multiple planets or moons with breathable atmospheres that we could seed with our own plants. Bearing in mind our scientific advances, I also wouldn’t necessarily bet against us finding ways to alter the atmospheres of planets (although, granted, probably not very quickly). I think the main liberty I took with science in my books is artificial gravity, which is sort of lazy, but I sort of salve my conscience by calling the device that does it the Heim Drive (Heim was a scientist who reported some small successes with anti-gravity and artificial gravity, although his experiments don’t seem to bear out the same results when repeated). The main factor of the galaxy the Keiko flies through is the fact that humanity has a faster-than-light drive (the Alcubierre Drive - that is real science, at least enough for NASA to be looking into it) but doesn’t have FTL communications. I did consider bringing in quantum entanglement (“spooky action at a distance”) that could theoretically provide instantaneous communication, but then decided that actually I liked the setting better without it. Having FTL travel without FTL comms makes the entire galaxy like a giant Wild West environment, where word can’t travel faster than the person carrying it and it you run hard enough and far enough, you might be able to outrun your own bad news. That seemed like the sort of canvas where I could tell big stories of deception and trickery and have the guilty parties get away with it again and again. As for the space stations, I just really like them, and figured they’d act a bit like service stations do now where you can stock up on supplies, fuel, air etc. Also, side note: Void Station Pundamilia got its name because I originally called it Void Station Zebra on a whim (I do a lot of things on a whim, often as a way of keeping myself amused while writing and to make the process more fun) and Rob veto’d it, saying it was “too much like a pastiche”. So I translated “zebra” into Swahili via Google Translate (probably inaccurate, but there you go) andvoila. No-one caught that one, so it made it in! Identity is an important factor in Dark Run: characters adopt and shed names, have secret identities, and change their appearances. How does this reflect on your universe and what it values? First things first: I’m almost 100% sure that Ichabod Drift is not his real name. As I’ve talked about above, my universe is one where you can potentially outrun your own bad news, but it almost certainly helps if you can change your name or appearance! I think my universe is certainly one that values honesty and integrity as much as ours does at the moment, but if you can fool someone into thinking that you’re honest or have integrity then that works just as well. However, I think that for the most part this isn’t always about actively trying to deceive people in order to get the better of them. For many of my characters, it’s about getting away from previous bad decisions or just trying to drop a former identity that they want nothing to do with anymore. The Keiko itself is full of people looking for second chances: apart from Kuai Chang, who’s only tagging along to keep an eye on his sister, everyone on there is getting away from something. As someone who’s worked with the homeless since 2004 it’s a theme I see repeated again and again in my day job, people wanting to say “that piece of my life, those decisions, those actions are behind me now: I’m making a new start”. Of course, sometimes it works and sometimes it doesn’t, and that’s exactly the same in the future I’m writing about. The followup to Dark Run is Dark Sky, which is due out March 2017 (In the US - The novel is available in the UK). What do you have coming up after that? Dark Run is now available from Saga Press.